Although figures on deadly violence against journalists in Colombia continue to decrease – for example, 2016 was the first year of the last seven in which there were no murders of journalists because of their work – the forms of censorship have “mutated” and are far from being overcome in Colombia. Cover of FLIP’s annual report. Screenshot. This is indicated by the 2016 annual report from the Foundation for Press Freedom (FLIP for its acronym in Spanish) which was released on Feb. 9 to mark National Journalist’s Day in the country. During 2016, FLIP recorded 216 violations to freedom of the press that translated into 262 victims. This represents an increase of 47 percent compared with 2015. In general, the pressures, threats, obstacles and aggressions multiplied. According to the organization, during the past year, there were 47 physical aggressions, 44 obstructions of journalistic work and 90 threats against the press. This last figure represents an increase of 52.5 percent compared with 2015. “Censorship no longer kills as many journalists as it did in the 1990s or early 2000s, but it has evolved into more sophisticated forms, which do not have sufficient public rejection and are able to hinder the free flow of information,” FLIP said in its report. One of the “most serious” cases from 2016, according to the organization, was the kidnapping of journalists Salud Hernández-Mora, Diego D’Pablos, Carlos Melo, William del Carmen Mora, Diego Velosa and Maria Zulay Ropero by the guerrilla group ELN in May. Obstacles to the work of the press were also present during coverage of the country’s main issues of public interest. One of these was the agrarian strike in Colombia that lasted 12 days, an event that made journalists more vulnerable to attacks by protesters. The theme of peace and postconflict occupied a special chapter of FLIP’s annual report. The organization wondered if freedom of the press will be guaranteed in the country during this time of peace, taking into account the background of coverage of the plebiscite and the prohibition of journalists from entering areas where demobilized members of the FARC will be located. The latter was established in the new peace agreement endorsed by Congress, which said that no civilians can enter these zones. Another chapter of the report talks about the Mechanism for Protection of Journalists, which FLIP believes needs to change. One of the aspects that it points out as problematic is that the National Unit of Protection (UNP) for the country continues to work in a “reactive” way, meaning, only when a journalist is facing imminent risk. For FLIP, the Government has failed to provide the necessary resources for “prevention,” which are stipulated in the mechanism, it said. The report also points out that the response time must be shortened, meaning the moment the request arrives until the UNP gives a final response. The FLIP also lists the judicial component as “missing” during the 16 years of the mechanism. The lack of convictions against those responsible is one of the causes for repeated attacks. 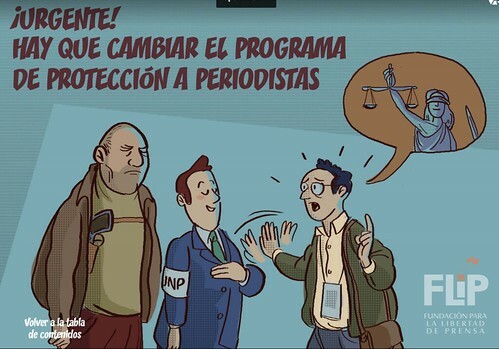 FLIP believes this situation must be taken into account by the Mechanism’s Committee on Risk and Recommendation for Measures (Cerem for its acronym in Spanish) to determine if a journalist should continue under protection measures. Other chapters of the report have to do with journalists in the regional areas of the country and the silence forced upon them, the high rates of impunity in crimes against journalists, as well as different laws that could affect journalistic practice. The organization also mentioned another form of censorship that is not direct or involving the use of violence. According to FLIP, it is increasingly common to use the judicial process to request that content be corrected or removed from physical and digital media. According to their data, people mentioned in the articles file lawsuits if this is not done. For FLIP, battles in the digital realm are even more difficult because “the transformation of the internet is leaving many open questions about what is legitimate or not in the network and who should make the decisions” concerning information leaks. Finally, regarding the authors of these attacks, FLIP documented that they were unknown most of the time, in 70 cases. In 41 cases, the aggressors were categorized as private citizens, while public officials and the public force occupied the following places as authors in 37 and 25 cases, respectively.